So You Think You Can Mom? : American Girl: Grace Stirs Up Success & Giveaway! American Girl: Grace Stirs Up Success & Giveaway! This Summer has been off to a great start! I am so excited to share that on June 23rd, American Girl and Universal Studios Home Entertainment have released a new movie on Blu-ray and DVD. The American Girl movie is called Grace Stirs Up Success and tells the story of American Girl’s 2015 Girl of the Year Grace Thomas, an avid baker with an entrepreneurial spirit who is motivated to follow her dream of starting a baking business after an inspiring trip to Paris. When Grace begins her French baking business with her two best friends, they combine their talents and discover many sweet rewards! I also want to share news of an exciting partnership with Williams-Sonoma that includes American Girl-branded baking sets, utensils, food mixes, and a cook book. These items are perfect for girls to explore the kitchen and bake alongside friends and family. All of the mentioned items will be available this Fall at Williams-Sonoma and American Girl stores, as well as online. Mya couldn't wait to use her American Girl cookie cutter in the shape of the Eiffel Tower. She loves all things Paris and really enjoyed watching Grace Stirs up Success over and over again. We baked chocolate chip cookies and sat down to watch the movie for the 10th time! 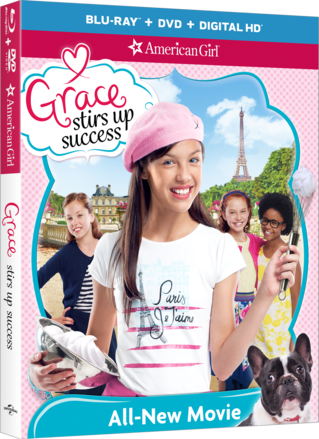 I've got an additional copy of American Girl: Grace Stirs Up Success available on DVD for one of my readers. To win, just complete the steps below and leave your email info in the comments section. A winner will be selected at random.